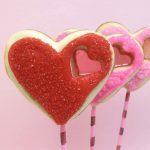 Licorice heart cookies on a stick for Valentine’s Day. 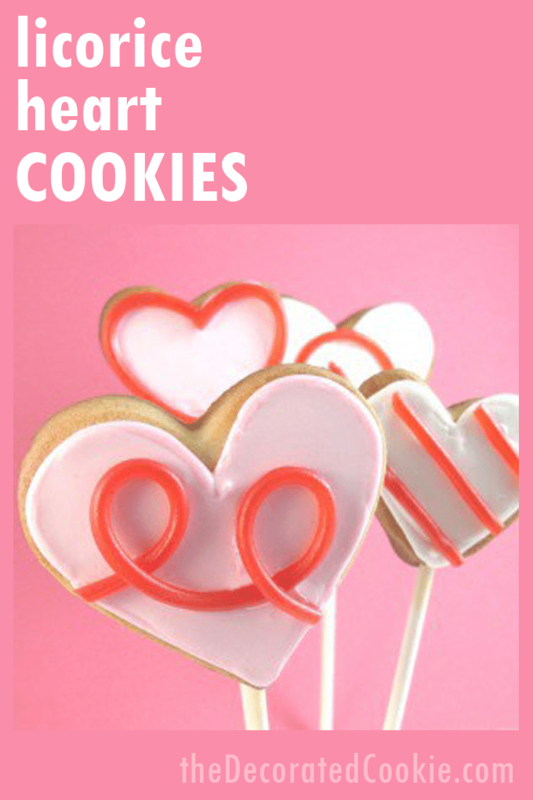 Still in a borrowed kitchen…still making cookies (specifically, licorice heart cookies for Valentine’s Day). Despite the chaotic state of my scattered supplies, I should note said borrowed kitchen is still infinitely nicer than the galley kitchen of our former DC rowhouse. (I cut out and decorated hundreds of cookies, 2 to 3 at a time, for my book using about 1 foot of counterspace.) Plus, our hosts’ oven actually seems to work at the right temperature. And it has lots of fancy buttons. 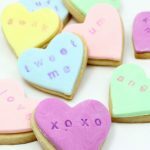 Here are some Valentine’s Day cookies. 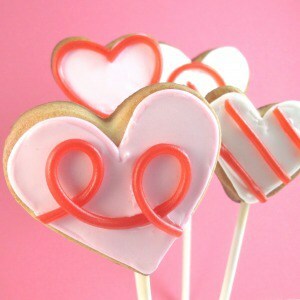 More specifically, licorice heart cookies pops. 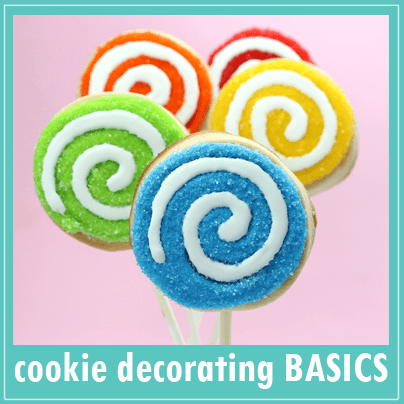 They needn’t be decorated on sticks, but I’m in a lollipop phase, so there you have it. 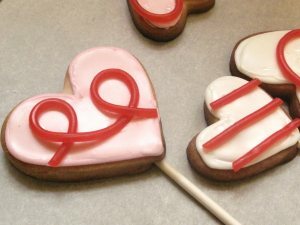 I used licorice to decorate, to mix things up a bit. 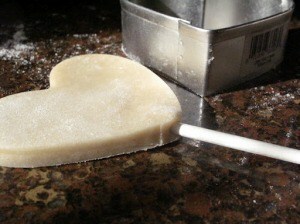 Roll out your dough thick enough to take the lollipop stick (about 1/4″). 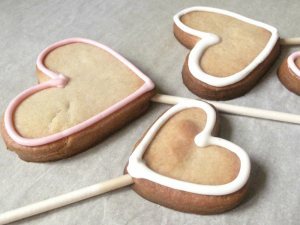 Lay cookies on a parchment paper lined baking tray and insert stick about halfway into bottom of heart. Pat back into shape if needed. Bake according to recipe and let cool. Mix about 1 cup each (or more depending on how many cookies you have, you will have plenty of frosting if using my recipe) of white frosting and light pink. Prepare 2 frosting bags with size 4 tips. 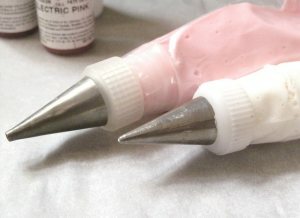 Fill one halfway (about 1/2 cup) with white frosting, fill the other halfway with light pink (I mix a couple drops of Electric Pink with Bright White color). Tie both closed tightly with the rubber bands. Pipe outline on heart and let set a good 15 minutes. 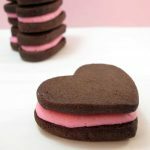 Add water to remaining white and pink frostings to thin until syrupy. Add 1/4 teaspoon at a time so you don’t go too far. 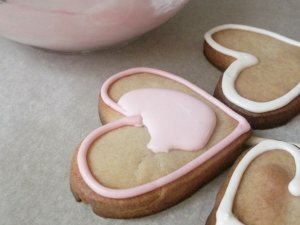 Pour a little white frosting in the middle of the hearts with white outline. Spread with a small knife or spatula until covered. Repeat with the pink hearts. Let set a good hour or two. 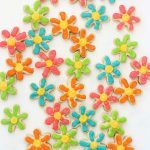 Take a piece of licorice lace or pull off a piece of Twizzlers. 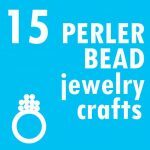 Using scissors to trim, decorate your hearts with checks, swirls or loops. To adhere the licorice, dab your finger in light corn syrup and run along the back of the licorice. Tips: Lightly lay out the licorice first, then adhere. I snipped the ends after adhering to the cookie (as in, I snipped off the licorice overhang to fit the cookie). Let dry several hours or overnight. 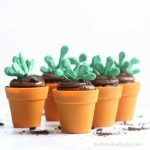 I am so making these…thanks for sharing..I love this blog! Thanks Christine!!! I so heart feedback. 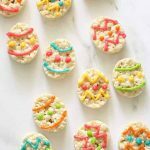 Your cookie creations just get better and better! Always a treat to visit. tally love your blog. Bought your book two days ago and can’t wait for it to get here. Thanks also to Selba, pam and back2basics! Makes my whole day to get such lovely feedback. what kind of lolipop stick do you use? this cookie on a tick is a totally fabulous idea. 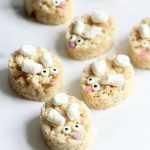 I’m making these for sure! I meant to say “stick” not tick. I can’t spell but I CAN read blogs and I’ve just subscribed to yours. Thanks Damaris! I miss letters on this silly keyboard all the time! As for the lollipop sticks, I just use the plain, white, cardboard? (unwaxed) ones from the craft store. I get mine at Michaels, but any big craft store should have them. AC Moore, etc. I always stay nearby when baking because I’m fire-phobic, but I’ve never had any problems. Absolutely adorable! 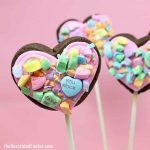 Beautifully decorated…I will have to make these! Hello! I saw your photo on tip junkie. 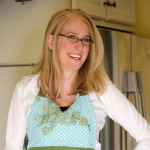 I'm gathering some desserts & treats to feature on my blog for Valentine's Day. I'd love to feature your cookies, if that's okay? No problem Jerri! thanks for the interest and thanks for the tip junkie tip! Didn’t realize I was featured, so that was a nice surprise. By the way, apparently these are kid friendly, too! My friend made them with her 3 and 5 year olds and sent me pictures. They looked amazing!